Podcasting has come a long way since its inception. As of 2018, iTunes has more than half a million active shows, and Apple Podcasts recently passed 50 billion all-time episode downloads and streams. Individuals use podcasts to tell stories and connect with listeners, while businesses can use them to become thought leaders in their industry and rake in advertising dollars. Podcasting is a huge business, but getting started when so many other podcasts have beaten you to the punch can seem overwhelming. The How To Start A Podcast Bundle has four courses that will take you from setting up your mic to becoming a profitable show. This course shows you how to set up your podcast for success by covering the technical, creative, and business elements of the craft. Led by instructor John Lee Dumas, the founder of the #1 podcasting community in the world (Podcaster’s Paradise), you’ll learn how to select the right equipment, create radio-quality recordings, edit your audio, and explore syndication options. You’ll also find out how to figure out your target audience and market yourself, so you can take the fun of podcasting and turn it into financial gain. The best way to grab a listener's attention is with a captivating story. In this class, Alex Blumberg, the award-winning reporter and producer of “This American Life,” teaches you how to create great stories from interviews and set your podcast apart from the herd. You’ll learn how to develop narrative structure, integrate storytelling principles into your podcast, and figure out how to prepare for each interview and get the best answers for an enthralling episode. 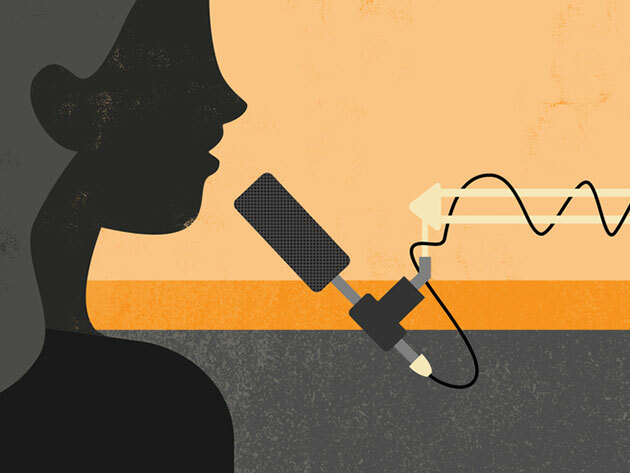 Take your storytelling skills a step further with these tips from the producers of NPR’s hit podcast “Snap Judgment.” Crafting a story with dramatic tension, solid characters and a meaningful message will help you turn your ideas into a gripping narrative. In addition, you’ll learn how to understand the best ways to pitch your story, construct focused story arcs, and establish a closer connection with your audience. Once you’ve nailed down the basics and created content that resonates with your audience, you’re ready to take off and make some cash with your podcast. Creator of the popular “The School of Greatness” podcast, Lewis Howes takes you through a successful podcast episode step-by-step, deconstructing the anatomy of a good episode and showing you how to use your knowledge to differentiate your podcast. He’ll also tell you how to pick the right format for your show and how to monetize your new creation. Take your podcast from pipe dream to profit with this bundle. Normally it’s $266, but you can snag it now for the sale price of $49.